Overall, an alright read. I picked this up from the clearance section because I like zombies and I like poetry. Figured it would be good for a quick read. Part of the problem with this book was that it wasn't really a good fit for me. It was a little gory for my taste. 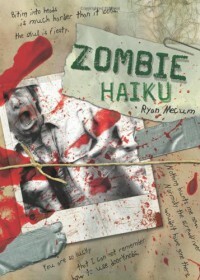 Yes, I know, it's a zombie book, but some of the poems were just a little too icky for me. Plus, the same images kept popping up over and over again, which got a little boring. Yes, we get it, you like to write about toes and eating hair. The other issue I had was that the haiku is not the most exciting poem. They are fairly easy to write and not all that impressive to read. Because of this, the book got a little dull at times. It was a neat idea to write an entire story in this manner, but the end result was kind of lackluster. Plus, the whole zombie story wasn't that interesting. The basic plot is that a survivor finds the haiku journal and you the reader get to read the strange journey of a man as he becomes a zombie (and continues to write haiku for some reason). I was a little confused about this. So zombies can't remember how to use doorknobs, but can remember what a haiku is, how to write a haiku, and also how to actually write (as well as type- I don't even know why a zombie would type poems and then tape them into the journal, really confused about that)? The set up was interesting. Interspersed in the book are photos (why was the zombie taking pictures? ), drawings, and miscellaneous items (teeth, blood spatters, hair). Again, not sure why a zombie would think to include such materials in the book it insists on carrying around. With all the grabbing and attacking, you'd think the zombie would have dropped the book a lot sooner. Anyway, I think the idea for this book was better than the execution. A zombie story written in any form of poetry is an interesting task. However, in this case, the story is pretty basic (and didn't really make any sense), some of the gore is a little over the top, and the haiku format isn't that interesting. Fine for a unique and quick read for zombie fans.